What beloved Christmas traditions do you have as a family? Over time, Christmas and its meanings have changed for me. As a child the memory of cold mornings, waking so early the sky was dark and the inescapable excitement tiptoeing to open golden wrapped presents still lingers even now. As you get older the joy of receiving gifts is replaced with the joy of giving them, the time with family, the laughter and burnt sprouts. This is what Christmas means. Time has not changed some things, even now I have my own family. We do the same things every year: put up a tree and haphazardly cover it in lights; send homemade cards that shed red glitter to loved ones; hang colourful socks over the fireplace and listen to festive songs on repeat. Yes, these are our Christmas traditions. Hang a stocking on Christmas Eve. Originally, children simply used one of their everyday socks. Nowadays stockings come in all colours and sizes. In youngers years we handmade our own felt versions. 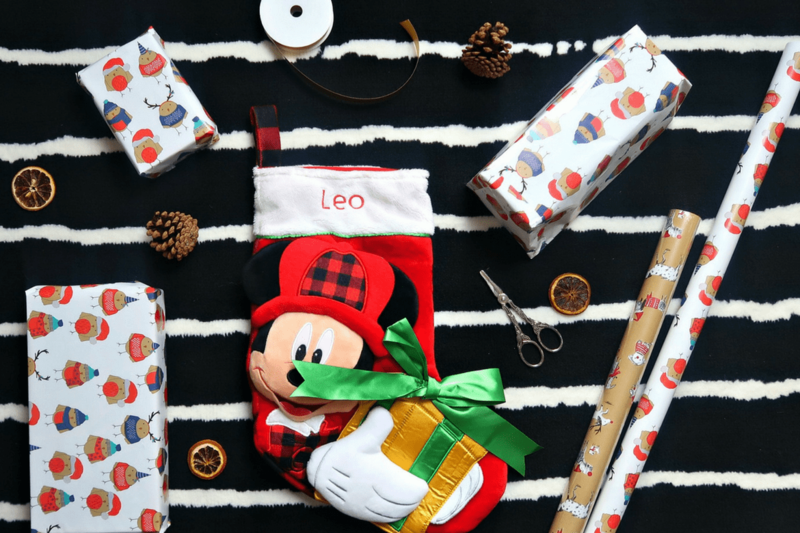 My son has this beautiful personalized stocking from the Disney Store, who better than to help out with creating Christmas magic!? Most families will hang stockings Christmas Eve on fireplaces or at the foot of beds, we like to put them up when we decorate the house in early December. We all know that Santa is supposed to be the one stuffing the stockings, but sometimes the jolly old guy in the red suit needs a little help from parents. Top stocking filler present ideas for boys. It can be tricky to decide what to put in your children’s festive hosiery. You want relatively inexpensive items such as toy cars, bubbles, chocolate, oranges, socks, books, stickers, felt tips, Lego, balloons and soft toys. The Disney Store offers some beautiful choices that are bound to be well received by children focused on their favourite films and characters. A lover of teddies my son will love cuddling up to Baymax on Christmas day. Pick presents of different sizes and shapes to squeeze in the stocking. I try and include some useful presents, like a drinks bottle (we get through 100 during the school term) and clothes. Socks are a classic. A perfect choice is these lovely soft Mickey pyjamas from the Disney Store either to open on the day or to snuggle up in whilst waiting for Father Christmas! How about a DVD to distract the littles whilst you are peeling potatoes? Moana is on repeat in our house at the moment but I am sure we will be getting on the classic Christmas films soon. What’s your stocking of choice? A tube sock, a silk stocking, the traditional red and white variety, or something else completely? Note: Disney kindly gave us the products for purpose of this post. All opinions are our own.